Thursday, 25th August: 1st, 2nd and 3rd Years. Friday, 26th August: 1st, 4th, 5th and 6th Years. Congratulations to all students on Prizegiving 2010-11. 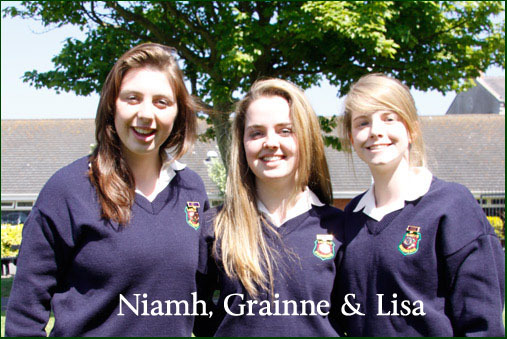 TY Students of The Year: Sinead Conroy, Eimear Gorey & Deirdre Harford. 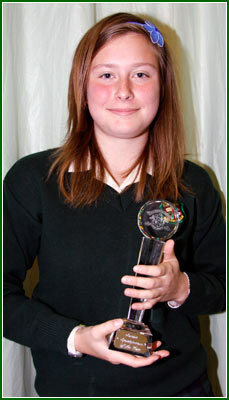 TY Sports Student of the Year: Carla Rowe. 1st prize in the secondary school category of the Balbriggan Summerfest Schools Choir Competition on Wednesday last. Best wishes to all our students in the upcoming examinations. Third Year Blocked Timetable is now available. Click Here. 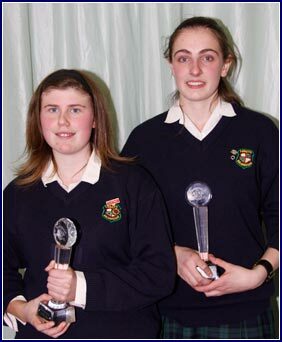 Junior Students of the Year - Deirdre Cleary & Niamh Gibney. Junior Sports Student of the Year - Veronica Paguba. Golden Boot - Shannon Richardson. Well done to Deirdre Harford and Lisa Coleman on coming first and second in the Stephen Chu essay competition. The girls were awarded their prizes by the President of D.C.U. Dr. Chu is a Nobel laureate and President Obama’s Energy Secretary. He spoke at D.C.U. earlier in the year. The essay focused on a response to his lecture. music teachers, Ms. McFadden, Ms. Macken and Ms. Kearns. Hard luck to the Senior Team on their narrow defeat to St. Joseph’s of Cluny. 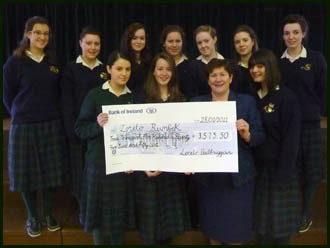 The 2nd and 5th Years Fund Raising initiative was completed this week. Transition Years are being interviewed as part of their end of year assessment. 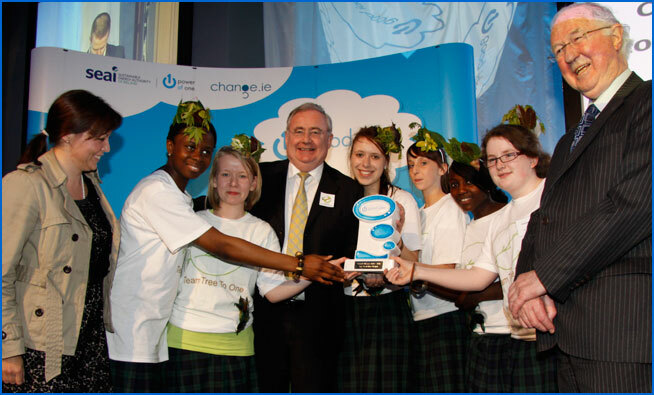 Well done to each of the three teams from Loreto Balbriggan, who qualified as one of the ten finalists, in this year’s “One Good Idea”, national environmental competition in Dublin Castle today, especially to "Team Tree to One", who were overall winners of the Competition. (Pics below). The U.14 soccer team were narrowly beaten in the Leinster League final. Well done to the girls and their coach, Mr. O’Brien. 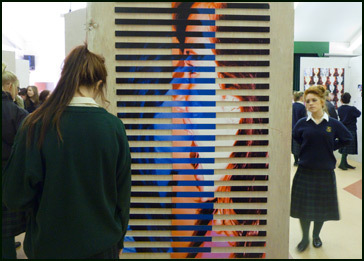 Junior Cert Art Practical examinations took place this week. 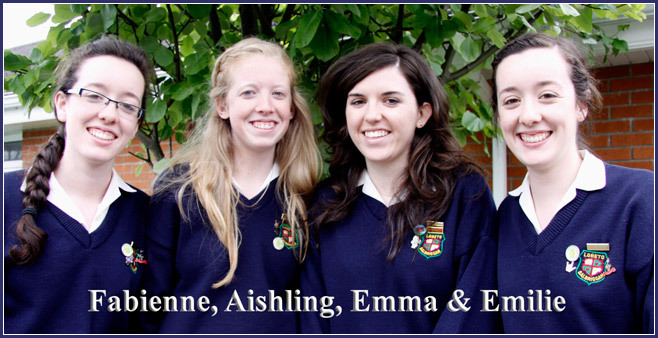 Deputy Head Girls: Emilie Renaudin, Emma Cooke, Fabienne Renaudin. Congratulations to the girls. Other positions will be finalised in the coming weeks. The 2nd Year/5th Year fundraising drive is on going with a number of events. 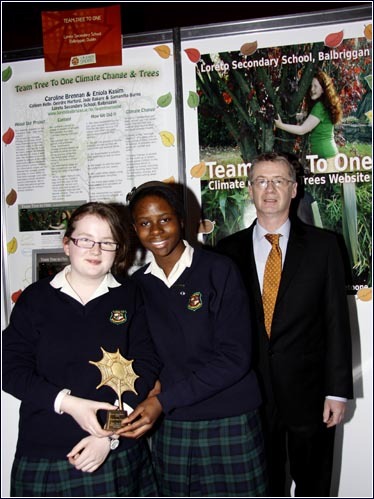 Overall Winners: Team Tree To One - Eniola Kasim, Samantha Burns, Deirdre Harford, Colleen Kelly, Jade Bakare & Caroline Brennan, with their teacher Ms. Derwin, Mr. Pat Rabitte, Minister for Communications, Energy and Natural Resources and Mr. Brendan Halligan, Chairman, SEAI. 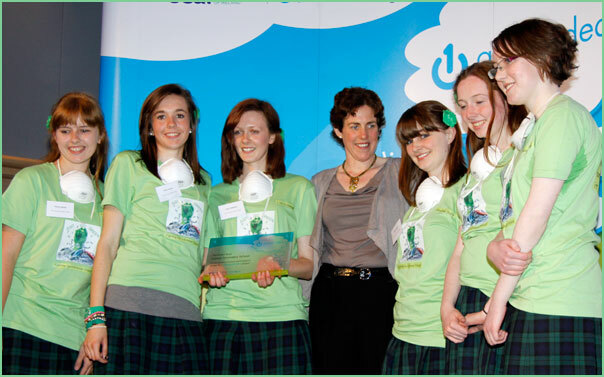 Finalists: Team Just Go Green - Fiona Carter, Clara Hynes, Lisa Coleman, Aisling Duff, Lorna Staines & Eimear Gorey. Finalists: Team Waste Watchers - Sinead Conroy, Claire Cooke, Kelly Meehan-Brown, Stephanie Nugent, Roisin Callaghan & Ruth Hanrahan. 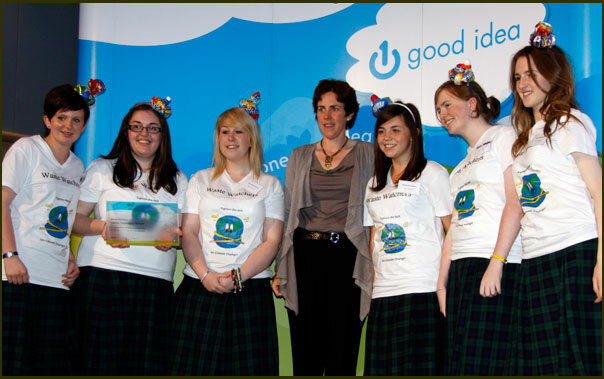 One Good Idea Final 2011 from SEAI on Vimeo. Supervised Study over Easter was a great success. Saturday morning study continues in May. Forty Transition Year students are on their Gaisce walk to Carlingford this weekend. Well done to our tennis teams on their performance this week. 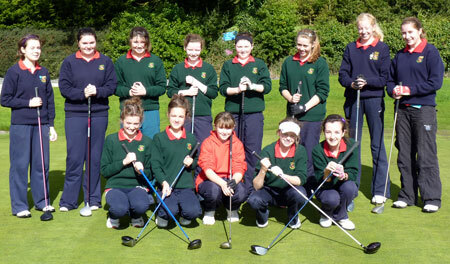 The school’s annual golf competition took place this week. 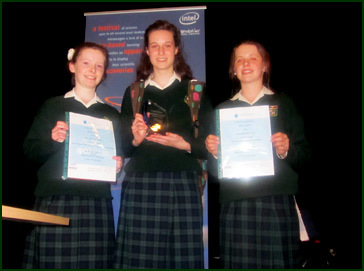 1st place: Aoife Phillips, 2nd place: Aishling Spillane, 3rd place: Aishling Farrell. Interviews for Student Leadership, 2011-12 commences this week. Well done to our soccer teams who have reached two Leinster semi-finals. Practical Art Examinations for Junior & Leaving Certificate are taking place this week and next. 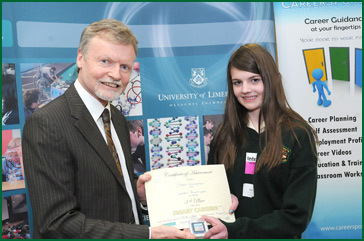 Nell Garvey, Abbot Runner up Best project award & 1st place Life Sciences, Junior Individual award. 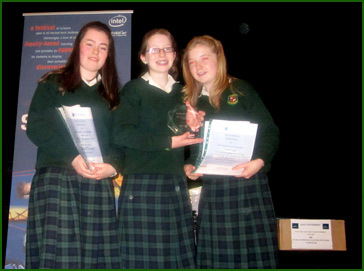 Roisin Lacey, Bronagh Kirwan & Niamh McKeown - BT Best overall Communicator Award & 1st place Life Sciences, Junior Group award. 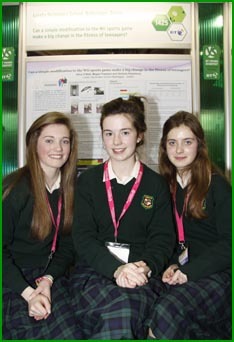 Laura Hennelly McCarthy, Rachel Taylor, Juliette Bosschaert - Highly Commended, Physical Sciences & Intel, Discover Sensors Award. Congratulations also to Scout Mitchell, Kenzie Mason & Michelle Burke on the tremendous efforts they put into their projects. We are very proud of all of them. And congratulations to their teacher, Dr. McNally, who received a teachers award. Well done also to all the athletes participating in the North East Leinster Athletics and the Loreto Athletics. Roisin Leahy won a Bronze 1500 metre and Erin Devine a Silver in the Leinster and a gold in the Loreto. Well done to 2H on their fundraiser for the Simon Community. 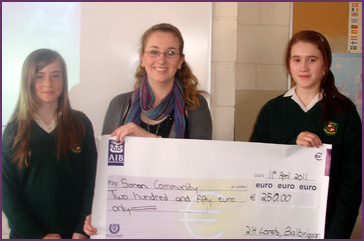 They raised € 250 as part of their CSPE action project. Particular congratulations to the Transition Years on their wonderful performances of “The King and I”. Well done to the Senior Soccer Team on reaching the semi finals of the Leinster League. Well done to the Junior Debating team on reaching the final against Loreto Beaufort. 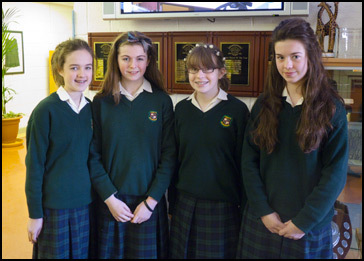 They are Alice O’Neill, Roisin Leahy, Izzy Rioch and Fiona Garvey. The Exercise Energise Women in Sport classes were involved in a day’s activities. Congratulations to the U.18 Soccer team who won against Eureka Kells. Well done to third year students Joanne Harold, Hannah O' Connor, Zoe Connolly, Megan Weston, Sophie Donnelly and Niamh Eccelstone on their fine performance in the ISTA Eureka Science Quiz Competition in Belvedere College. Oral Irish exams took place this week for Leaving Certificate students. Home Economics & Music Practicals are underway and will continue next week. Intensive dress rehearsals for “The King and I” are underway. Best of luck as they begin their performances next week. Congratulations to all students who participated in the Loreto Athletics competition in Santry Stadium on Thursday. Well done to Erin Devine who came first in the 500 m race. 4th Year students took part in a Mock Trial Competition on Saturday in the Criminal Courts of Justice officiated by Judge Paul Carney. The students performed very well, winning 2 out of 3 trials. Congratulations to the Senior Basketball team who won the East Leinster Dublin Schoolgirls, U.19 competition. Students received their HPV injections this week. Third Year Students were on a Geography Field trip to the Burren. Intensive dress rehearsals for “The King and I” are underway. Preparation for two weeks of Orals/Practical are ongoing. 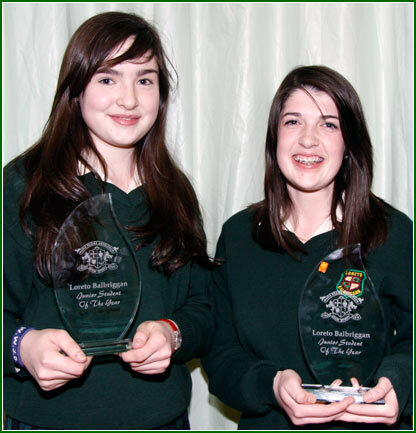 Well done to Alexa Donnelly and Niamh Harford in the final of the Denny Debates on Monday evening. 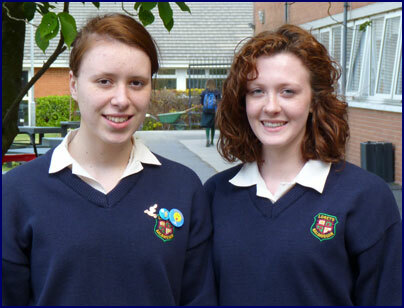 Best wishes to Alexa Donnelly and Deirdre Harford in the final of the Denny Debates in U.C.D. on Monday, 28th. The girls are proposing the motion that “Violence is a legitimate form of Civil Disobedience”. The First Year Public Speaking Competition took place on Friday, 25th. The runners up were Eryn Devine and Julie O’Connor. The winner was Stephanie Corrigan. Congratulations to Ms. McMaster and her 1C History class on winning the €4,000 first prize for the Millfield Time Capsule Competition. Third Years attended “The Merchant of Venice” on Wednesday in the Helix. 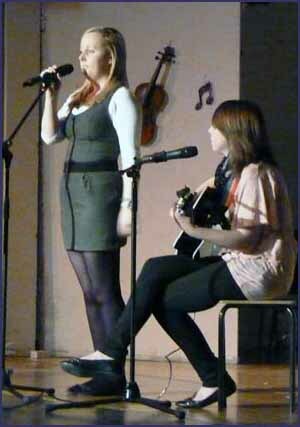 Well done to Hannah Hawkshaw who won the Junior Talent Show on Thursday, 24th March. There were Gaelic, Basketball and Golf teams in various matches this week. The JPIC group gave a presentation to different year groups on World Water Day. Congratulations to Hannah Hawkshaw, Olivia Whelan and Julie O’Connor on wining prizes in the Balbriggan Town Council St. Patrick’s Day Competition. expert and adviser to President Obama. Seachtain na Gaeilge continued this week with a number of activities. Well done to First Years on their Gaelic match this weekend. 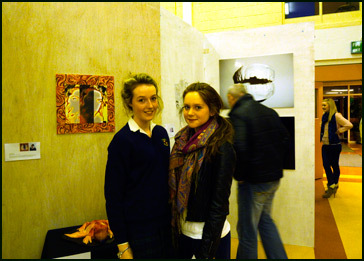 Congratulations to the Fifth Year Art students on their excellent Art Exhibition “The Looking Glass”. These are contemporary self portraits based on the students visit to IMMA earlier in the year. The curators of the exhibition were Niamh Conway, Lesley Goulding, Fabienne Renaudin and Laura Fitzpatrick. (A few photos below). News Update - March 11th, 2011. Congratulations to Alexa Donnelly and Niamh Harford on winning their semifinal and qualifying for the final of the prestigious Denny Debates. Well done to Sinead Conroy who also participated. 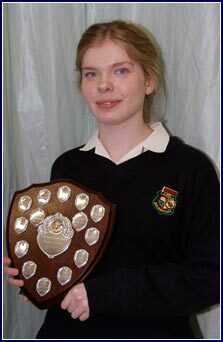 Sophie Donnelly won the Best Speaker at Irish University Women’s Federation Public Speaking Competition in T.C.D. Emma Cooke and Susan Byrne also participated in the Soroptimists Public Speaking Final in Athlone on Saturday, 5th March. The Loreto Mace Debates took place on Thursday, 10th. 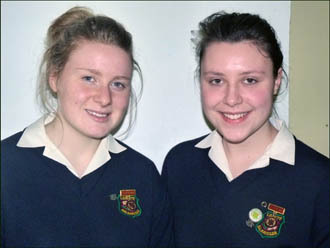 Emma Cooke and Roryanne Sweeney represented the school. All First Years visited Newgrange this week as part of their History Programme. Ashes were distributed on Ash Wednesday. The Transition Year Parent Teacher Meeting took place on Thursday, 10th March. Seachtain na Gaelige has begun with a wide range of activities. 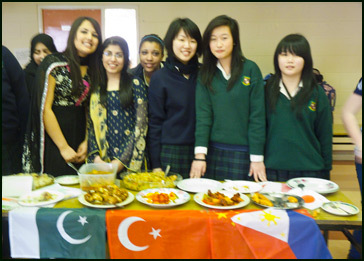 International Women’s Day was also marked in the school. The 4A Film Studies class were involved in a film making exercise all week. News Update - Mar 4th, 2011. 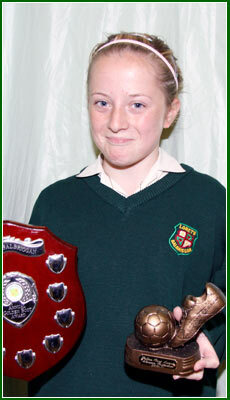 Sophie Donnelly participated in the Joyce Craig Cup for Public Speaking. This competition is sponsored by the Irish Federation of University Women. Hard luck to the U14 soccer team who were defeated in the Leinster Quarter finals. Well done to the Senior Basketball team who have reached their League final. The Fifth Year Parent Teacher meeting will take place on Friday, 4th March, a.m. while the First Year Parent teacher Meeting will take place p.m. The Assessment Tests for Incoming students will also take place on Friday. Well done to the following 5th Years on winning the school’s language scholarship: Aisling Farrell (Irish), Grainne Barrett (French), Una Reynolds (German). Please note the school’s new mobile phone policy (available from menu on left of this webpage) which will be in operation from Monday, March 14th. News Update - Feb 18th, 2011. Best wishes to the Fifth Year Group under the leadership of Ms. Gallen and her team of teachers on their ski trip in Italy. 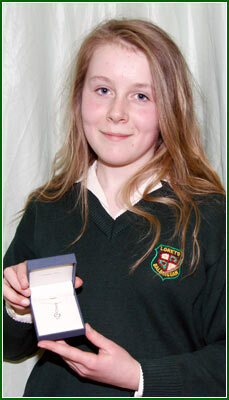 Well done to Roisin Leahy on her performance in the 2,500 metres Leinster Schools Cross Country in Santry. Mock examinations ended on Friday, 18th. The mid term break begins on the 19th and students will return to school on Monday, 28th February. Well done, also, to Sinead Conroy, Alexa Donnelly and Niamh Harford who have qualified for the Semi finals of the Denny Debates Competition. News Update - Feb 11th, 2011. Well done to Emma Cooke & Susan Byrne on being joint winners of the Soroptimist Regional Final in Ballinasloe on Saturday, 5th Feb. The girls have qualified for the national final in Mullingar in March. Congratulations also to Sophie Donnelly on winning the Dublin University Women’s Graduates Association Public Speaking Competition. Mock Examinations for Junior and Leaving Certificate Examinations have begun and will continue into next week. Saturday Study continues this Saturday 12th February. A number of students are preparing entries for SciFest. Student council members for 2011 are listed here. News Update - Feb 4th, 2011. Mock Examinations for Third & Fifth Years have begun. Transition Years are on work experience placement in the three weeks prior to the mid term. Well done to hockey, basketball and Gaelic teams on their matches this week. Congratulations to Roisin Leahy on her fourth place in the Schools North Leinster 2000 metres. Best wishes to Emma Cooke & Susan Byrne competing in the Regional Final of the Soroptimists Public Speaking Competition this Saturday 5th in Ballinasloe. News Update - Jan 28th, 2011. Congratulations to Maeve Kavanagh on the presentation in Dublin City University of being in the top 50 Business students, based on her Junior Certificate Examination. Transition Years are taking examinations on Thursday, 27th and Friday, 28th before going on a three week work placement. Hard luck to the U.16 soccer team on their quarter final defeat and well done to the U.14 team on reaching the Leinster quarter finals. Saturday study continues this Saturday, 29th, 9.15 – 12.15 p.m.
Congratulations to Niamh Harford and Alexa Donnelly on reaching the quarter final of the National Denny Debates Competition. The motion was “That this house would put off funding the Irish Language”. Sr. Kathleen MacLennan received the cheque from 6th Years for the Rumbek fundraising. She also gave an inspirational talk on the Loreto missions. Best wishes to the 1st Years on their basketball tournament on Friday, 28th Jan.
Well done to the hockey team on their matches this week. This has been Mary Ward Week in all Loreto schools. 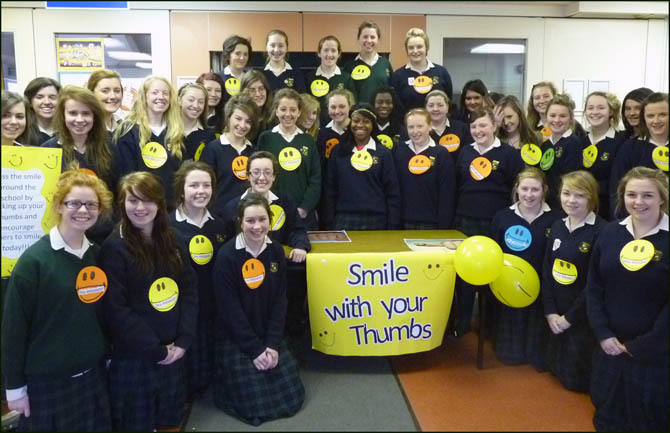 Loreto Balbriggan have also combined those celebrations with Mental Well Being Week. Among the events organised: Posters and Stickers on the theme. Thought for the Day. Positive Thinking Workshops. Destress packs for Sixth Years. Smile for Thumbs Up Day. Meditation. News Update - Jan 21st, 2011. Saturday morning study from 9.15 – 12.15 will continue this week. The 2nd Year Parent Teacher meeting took place on Tuesday, 18th January. Transition Years are preparing for their work experience placement. This will be over the first three weeks in February. Well done to all our hockey teams on their matches this week. Hockey training is on Monday on the astro turf pitches next to Skerries Community Centre. Best wishes to our U. 16 soccer team on their semi final in the Leinster Cup on Tuesday, 25th January. 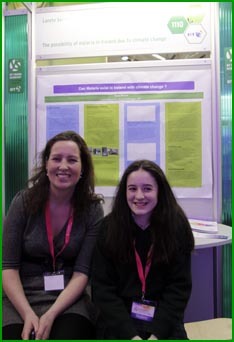 Young Scientist Success - Jan, 15th. News Update - Jan 13th, 2011. Emma Cooke & Lauren Fagan for their project, "BLASTing the flu"; an investigation into the similarities and differences in the H1N1 virus sequence in order to examine the effectiveness of the World Health Organisation (WHO) vaccine. Scout Mitchell for her project, "The possibility of malaria in Ireland due to climate change". Alice O'Neill, Megan Freeman & Victoria Fitzsimons with their project, "Can a simple modification to the Wii sports game make a big change in the fitness of teenagers?" 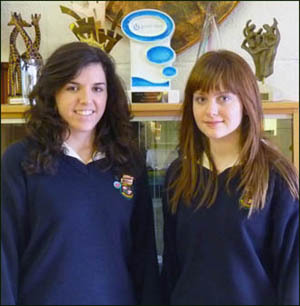 Well done to Roisin Hickey and Chloe Moore who have qualified for the Regional Final of the Doodle for Google Competition. The school will be opened for supervised study on Saturday mornings until mid term from 9.15–12.15. Congratulations to the U.16 soccer team on defeating Eureka Kells in the Leinster Cup quarter final. Students received their second HPV injections on Wednesday, 12th January. Well done to the hockey teams on their match against Rathdown. Instructions on preventative measure for Swine Flu have been forwarded to students. Music students are on a weekend trip to London. The mock examinations timetable is now available. News Update - Jan 10th, 2011. There has been a recent increase in the number of persons presenting with influenza in our hospitals. The following advice has been issued for parents by the HSE. 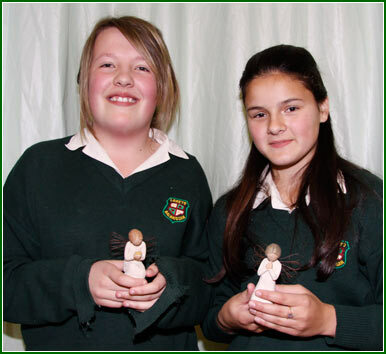 Well done to the winners in the Tera Spiders, Projects Category, of the Junior Spiders Web Competition, the Irish schools internet awards: Caroline Brennan and Eniola Kasim. Caroline and Eniola are part of a Power of One Team with Colleen Kelly, Samantha Burns, Jade Bakare and Deirdre Harford. Their project, Tree To One, is aimed at promoting awareness of climate change and the role of trees in ameliorating its effects. (Photos below). 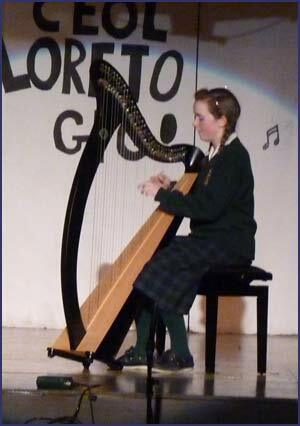 There was a wonderful Ceol Loreto Gig on Tuesday, 21st. Congratulations to Hockey teams who played this week. The First Years were defeated while the Second Years won 2–1. A group of Transition Years were involved once again in the Santa Flight organised by Ms. Briscoe. The Second Year Debating team of Izzie Rioch, Fiona Garvey, Alice O’Neill and Roisin Lacey defeated Loreto Swords in the Loreto Debating Competition. Please note that the 1st Year Parent Teacher has been rescheduled for Tuesday, 21st December from 2 – 4 p.m. 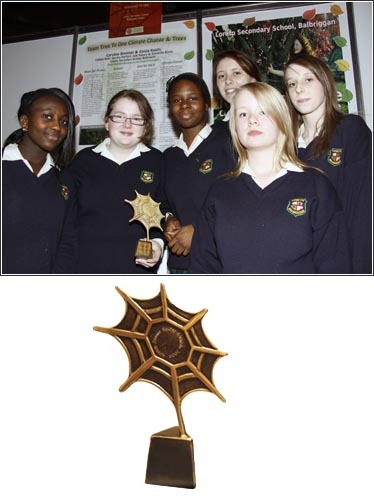 Team Tree To One, and Caroline & Eniola with Mr. Fynes, and their Junior Spider award. Congratulations to Caroline Brennan and Eniola Kasim on being shortlisted for a Junior Spider Web Award. Caroline and Eniola will attend the awards ceremony in the Helix in DCU this Friday, the 17th of December, where the winners will be announced. The girls have being working hard throughout this term, on their project, Tree To One, aimed at promoting awareness of climate change and the role that forestation has in combating its effects. Christmas tests are on-going. Results will be forwarded to parents in early January. Relationships and Sexuality Talks for Transition Years were provided by Accord this week. Well done to Izzie Rioch who competed in the final of the Coca Cola “Schools Stars” this week. Sports matches, including Senior Basketball finals, were cancelled due to weather conditions. The H.S.E. provided the second set of injections for the HPV virus in the past ten days. This vaccination was for 1st and 2nd Year students. Leinster and the All Ireland trophies in school. Details of Christmas Arrangements will be on the website next week. 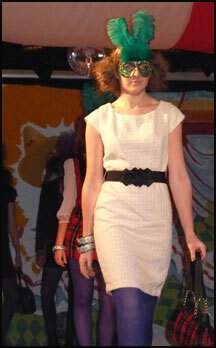 Congratulations to Aisling Lennon and Michelle Briscoe, with Transition Years on a spectatular Fashion Show. 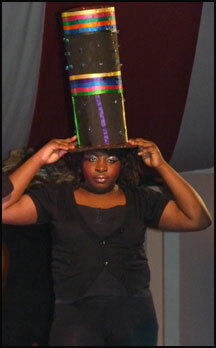 The theme of the show which was held on Wednesday and Thursday nights was the Circus. Best wishes to Alexa Donnelly, Niamh Harford, Emma Cooke and Roryanne Sweeney on their debating competition this weekend. 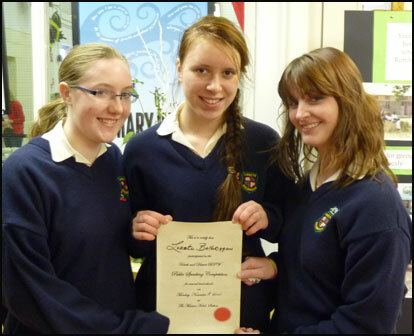 Well done to past pupils Eadaoin Copeland, Orna Donnelly and Sorcha Forde on winning Entry Exhibition Awards for Trinity College, based on their Leaving Certificate results. Well done to the U 16 Gaelic team on their victory this week. Well done also to our basketball, badminton and hockey teams on their victories and performances. Best wishes to Izzie Rioch in the final of Coca Cola “Schools Stars” next week. Well done to our Under 16 soccer team who won the first round of the Schools Cup. Fashion Show rehearsals are ongoing for next week’s show on Wednesday & Thursday. Well done to Alexa Donnelly and Niamh Harford on reaching the last 8 of the U.C.D Literary & History Society’s Secondary Schools Debating competition. The girls also have progressed to the next round of the Denny Debating Competition run by the combined universities. Particular congratulations to Izzie Rioch on reaching the final of the School Stars Talent Competition. The 2A class, as part of their C.S.P.E. project, have raised funds and organised a speaker from the Irish Guide Dogs for the Blind. The Concern Fast is underway this week. Congratulations to our soccer, Gaelic and Basketball teams on their matches this week. A number of events are being organised for Science Week in the school. Senior Geography students took their field trip to Skerries beach. Senior English students attended “Dancing At Lughnasa”. The Third Year retreat under the direction of Gerry Keegan took place this week. 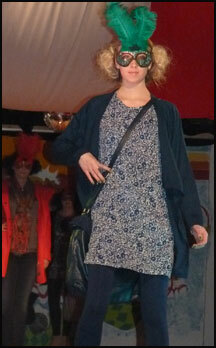 Well done to Lauren Owens who has reached the penultimate stages of RTE 2’s Model Search. The Third Year Parent Teacher Meeting occurred between 3.45 and 6.45 on Thursday, 11th November. Preparations for the T.Y. Fashion Show are well advanced. 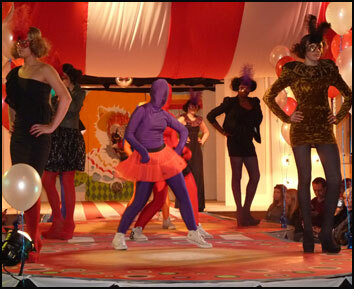 This year’s theme centres on the circus. 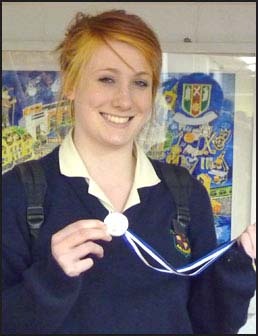 Well done to Rachel Nevins on winning a silver medal at the Loreto Swimming Gala . Our long awaited, and badly needed, extension is finally underway. Thanks to all concerned for their co-operation with the logistical procedures we've had to introduce during this time. The ladies Senior All Ireland cup came to visit the school on Tuesday with past pupil Niamh Hurley, a member of the winning Dublin team. All G.A.A. students were brought to the hall to meet with Niamh and her fellow teammate Amy. 1D, 1E, 1G and 1H travelled to Armagh for their retreat on Tuesday. They spent some time in St. Patrick’s Centre and then visited Armagh Cathedral. Although the rain poured relentlessly a great day was had by all. Transition year students were involved in a photography course with Tim Durham on Thursday and Friday. Each year the students produce outstanding work. A remembrance evening was held in the school on Thursday night. Many thanks to all involved and to all those who came out on a wintry night. Third years took part in their annual retreat on Thursday and Friday. The retreat was led by Gerry Keegan who has been working with our students for many years. As usual both days were a huge success and the students got a lot out of the experience. Congratulations to Ciara Daly in 1A who picked up two silver medals in swimming championships in Switzerland during the mid-term break. Eleven other countries competed. Well done to Ms McNally’s Young Scientists groups , three of whom got through the preliminary rounds and will be competing in the RDS in January. Well done to Lora Gilbert, Amy Walsh and Izzie Rioch who got through to the semi finals of Star School Stars Talent competition in TLT Drogheda. There will be a remembrance evening in the school on Thursday. November 4th. See Poster for details. Well done to our Equestrian team who had a high finish at the recent tournament. They were Laura McAteer, Sarah Monahan, Sarah Murphy, Lorna Mooney, Hilary McCormack, Kim & Leanne Murray. Sixth Years were involved in a voluntary week of Directed Prayer. 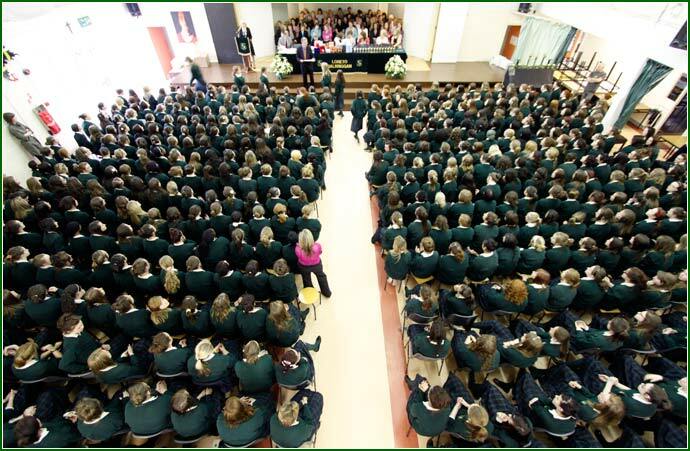 This week is offered every year to our Sixth Year group and takes place in the Loreto Convent. Transition Years were involved in the first of a week’s photography course with Tim Durham. Each year the students produce outstanding work. Well done to Basketball, hockey and soccer teams on their matches this week. Building work on our new wing has begun. Please note there is no parking or drop off available during construction. Student Council elections took place this week. The full list of the Student Council will be listed in the near future. 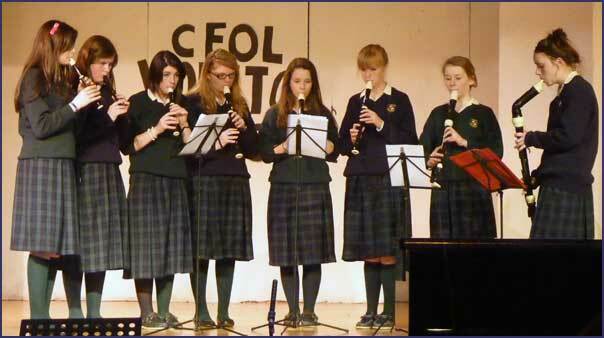 Parents Association meeting took place on Thursday, 21st Oct.
A wonderful Ceol Loreto Gig also took place on the 21st Oct. The wonderful talent of our students was greatly appreciated by the audience. 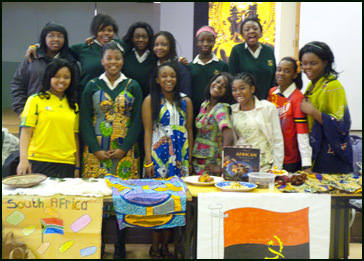 Our major fundraiser for our sister school in South Sudan, Loreto Rumbek took place on Friday, 22nd Oct. 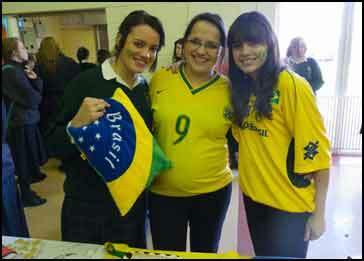 The Sixth Years along with Ms. Corrigan and Ms. McHugh organised the event. 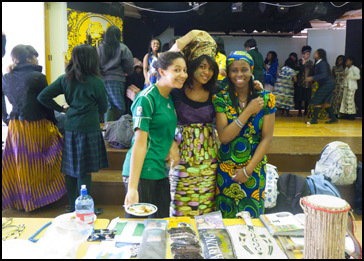 Staff and students wore African cloth for the non-uniform day. Well done to Maeve Kavanagh on being informed by the State Exams Commission that she was one of the top 50 Junior Certificate Business students in the country. Maeve will receive an award from D.C.U. in December. Well done to the girls involved in the Comhairle na nOg meeting on Wednesday in the County Hall. 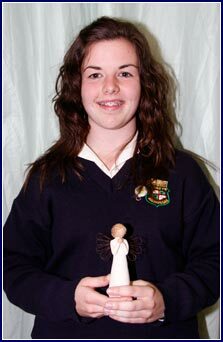 They were Emma Cooke, Kate Coscoran, Kate Rogers, Lauren Fagan, Rebecca O’Keefe, Stephanie Graham & Katie Fleming. Katie Fleming and Rebecca O’Keefe were elected to the council. 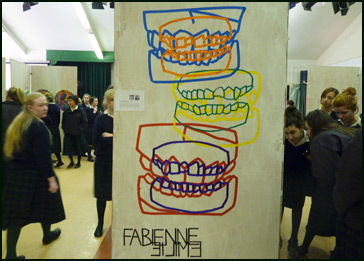 Congratulations to students and teachers on a superb Art Exhibition in the school hall on Thursday night. 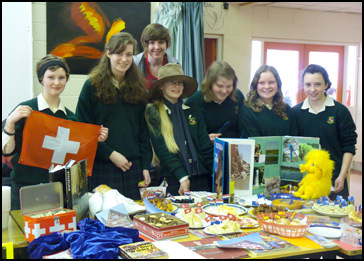 The main focus of the evening was the outstanding Junior Certificate work of June 2010. Well done to the Hockey teams on their matches this week. Well done also to the soccer and Gaelic teams on their matches this week. This was Maths week in Ireland. The school had a variety of events to mark this. The JPIC Conference for all Loreto schools took place in Emmaus this week. The participants for the school were Kate Coscoran, Dayna Curtis, Una Reynolds, Saibh Carson, Emma Cooke, Stephanie Graham and Molly Sweeney. Our new school extension will begin construction on Monday, 18th October. See letter already forwarded to students/parents. Well done to our Minor & Senior 4b Hockey teams on theirb matches this week. Well done also to our U14 soccer and U.16bGaelic teams. Congratulations to Roisin Leahy on her fourth place in the Clonliffe Invitational Schools 3000 metres. The Board of Management for the school for the period 2010 – 2013 is as follows: Sr. Gerardine Mullen, Chairperson, Mr. Vincent Rattigan, Ms. Carole Gallen, Ms. Kathleen Copeland, Ms. Caroline McHugh, Ms. Ann Marie McDonough, Ms. Gillian O’Regan, Mr. Paul Dowling. Students interested in taking up Volleyball should contact Mr. Daly. Fifth Year students, Emma Cooke, Kate Bauer and 6th Year Captains, Imogen Jenkinson & Michelle McCormack are in the process of forming a drama club for First Years. Best wishes to the following groups who have applied for entry into the Young Scientist Competition: (1)Wind energy from Traffic – What a Blast! Laura Hennelly McCarthy, Juliette Bosshaert & Rachel Taylor. (2) To prove that a simple modification to the Wii sports game can make a big change to fitness of fitness: Alice O’Neill, Megan Freeman & Victoria Simons. (3) Harnessing aptitude with apps – Finding solutions to heavy schoolbags using technology such as apple apps and websites: Nell Garvey & Nadia Grimes. 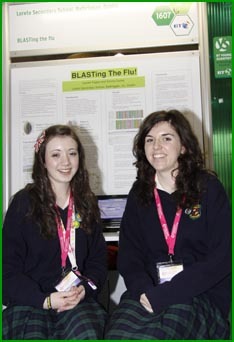 (4) BLASTing the Flu: Emma Cooke & Lauren Fagan. (5) The possibility of malaria in Ireland due to climate change: Scout Mitchell (6) SNP’s in the Irish Genome Sequence: Deirdre Harford (6) iPods Unplugged: Sara Beshir. Auditions for the Transition Year Musical “The King & I” are complete. The main roles are as follow: King: Caoimhe Reynolds, Anna: Kelly Meehan Brown, Tuptim: Tori Delahoyde, Lun: Ciara McGuinness, Chululongkorn: Alison Doran, Lady Thrang: Kala Whelan, Louis: Sarah Kenny, Captain: Aisling Duff, Kralahome: Fiona Costello, Edward Ramsey: Eimear Flynn, Wives: Ellen Fairclough, Christine Byrne, Rebecca O’Keefe, Saidbh Carson, Chloe Ridgeway. A school golfing competition took place in Hollywood Lakes (pic below). The winner was Therese Ferguson with Rachel Taylor in second place. The school’s Parents Association had their A.G.M. Shane Martin was the keynote speaker on “Positive Parenting”. Please note the re-arranged times for some Parent Teacher meetings and Staff meetings. The calendar is available on the website. The Transition Years had a most enjoyable trip to Causey Farm. Best wishes to our senior History & English students who are on a trip to London and Stratford this weekend. Congratulations to our tennis teams who participated in the Drogheda Schools Tennis League on Wednesday. 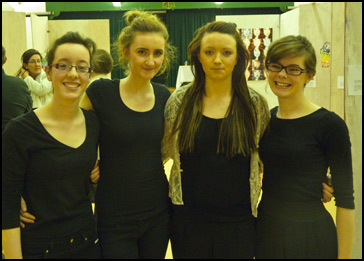 The teams were Loreto A: Naoise Dunne, Jenny Power, Aoife Dunne, Aoife Phillips. Rachel Taylor, Laura Hennelly McCarthy. Loreto B: Roryann Sweeney, Hannah Scott, Aisling McLoughlin, Sarah Murphy, Izzie Rioch, Megan Freeman, Veronika Paguba. Registration for First Year students 2011-12 took place in the school on Wednesday, 22nd September. Congratulations to our sailing students on their recent success. 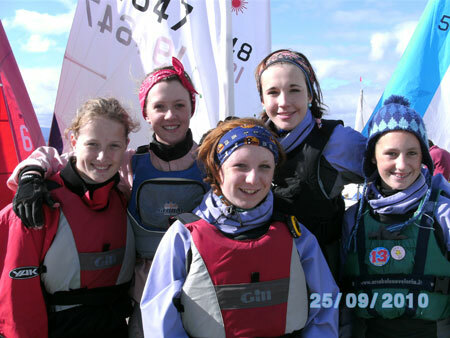 The girls came fourth in the school team element out of 33 teams in the mixed dinghy fleet. Sports training is in full swing. Please see the various sports notice boards for details of training. The school community were delighted to get approval for their major building programme to begin in the near future. Congratulations to the Senior Choir on their wonderful performance in the Helix as part of the recording for International Peace Day. All Ireland Final on Sunday, 26th Sept.
Congratulations to all our Transition Years on their excellent Junior Certificate results. 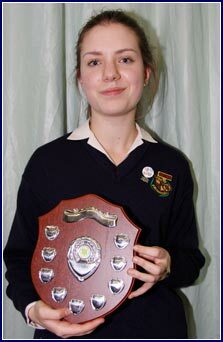 Well done also to Clare Donegan (pictured below) who won joint top prize in the 14-16 creative writing section of the national R.D.S. McWilliam’s Young Science Writers Competition. 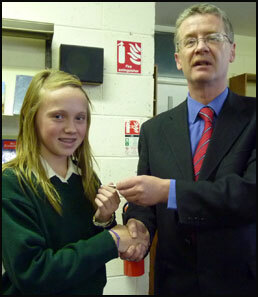 She was presented with her prize by Mr. Sean Haughey, T.D., Junior Minister of Education at an awards ceremony in the R.D.S. on Wednesday, 15th. The HPV vaccination for cervical cancer will be administered to First & Second Year on Tuesday, 28th September. Information Leaflets, letters of consent etc will be forwarded in the coming days. Following our Information Meetings for incoming students, September 2011, on the 14th & 15th September, registration will take place on Wednesday, 22nd September between 2 and 4 p.m. and 7 & 8 p.m. The Senior Choir has been invited by the Instruments of Peace group to join in a DVD recording to take place on the evening of International Peace Day, 21st September in the Space at the Helix. The recording will be filmed by Kairos Communications. 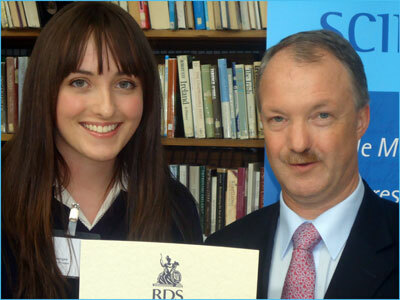 Clare Donegan, with her RDS Young Science Writers Award, and Minister of State at the Department of Education and Skills, Mr. Sean Haughey. Congratulations to all our outgoing Sixth Years on their successful Leaving Certificate results. Supervised Evening Study has recommenced. Please contact Ms. Jacob or Ms Nic Gabhann for details. Third and Sixth Years had a Study Skills session this week. Gaelic, Soccer, Basketball and Hockey training has recommenced. For details re Junior Certificate results, please see accompanying letter. 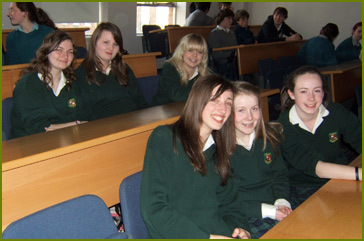 Information Evening for incoming 1st Years, September 2011, will be on Tuesday and Wednesday, 14th & 15th September. On Tuesday, those with surnames A – L should attend, and on Wednesday, M – Z. Meeting will start promptly at 7.30 p.m. A tour of school facilities will be available from 6 – 7 p.m.
We would like to welcome you all back to another school year at Loreto Balbriggan and hope that you have all enjoyed your summer break. On behalf of the entire school, we would like to welcome all new staff and students and we hope you have settled in well. 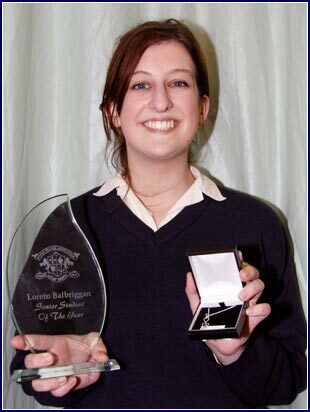 We would particularly like to welcome all first years to Loreto Balbriggan. We hope the transition from primary to secondary level has been a positive experience. Good luck to transition year students for your eventful year ahead and we hope that you will take every opportunity that comes your way. We’re all looking forward to the fashion show and this year’s musical! Congratulations to all newly appointed captains, coordinators and senior prefects. May you flourish in your role as student leaders. To sixth years, here we are in our final year of secondary school. We hope this year will be as enjoyable as our last five years. So let us all enjoy our last year together, hopefully we will make the most of it while remaining focused on our goals for next June. Finally, the very best of luck to the debs and yearbook committees who are working towards a successful end of year.